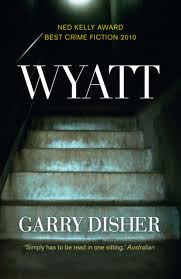 The latest Garry Disher novel to arrive in the U.S. is a continuation of his Wyatt series (about a dispassionate thief) rather than his police-procedural series (better known here). Wyatt recalls the noir end of Donald Westlake's oeuvre, and in fact Disher offers an homage to Westlake in two names that appear in the book (Stark, one of Westlake's several pseudonyms, and Parker, one of his longest-running characters). Disher's Wyatt has some of the same profile as Parker, a master thief for whom things are always going wrong. But in the new novel, Wyatt is confronting problems that Parker didn't have to: money that moves electronically rather than physically, new security systems, and the constantly rising surveillance of our world today. The characters in the Wyatt series are pretty much stock characters, interesting in their own way but reduced to their relevance to Wyatt (though the narrative does depart from the central character a good deal of the time). And Wyatt himself is always guarded, always careful, never emotional. He is a particular sort of sociopath: without empathy or even interest in his fellow humans; he's almost high-functioning autistic. There's a telling passage in which he is attracted to the central woman character (who is one of the most interesting characters, as she veers from normal life into Wyatt's world and then into Wyatt's point of view). He feels the attraction but doesn't quite know what to do about it. Wyatt is super-competent in other ways, and his inability to understand affection or to act on attraction keeps him human, in an odd way. He isn't vulnerable, but he's damaged. But the plotting is the outstanding characteristic of the Wyatt series. Through the twists and turns, Disher manages to manipulate the standard tropes of the noir-heist story in lively ways, much as Westlake did (though without the overt comedy that Westlake often employed). 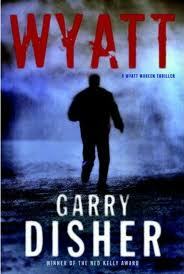 Disher's Wyatt (the novel and the character) are as dark as they come, but engaging and involving for the reader. Wyatt seems in some ways to be a posthumous tribute to Westlake, and is definitely both an excellent novel in its own right and the best "post-Westlake" take on that master's style that I've read. Continuing the discussion of covers: here are the Australian (from Text Publishing) and U.S. (from Soho Crime) covers—the Australian original by far the best, to my eye.